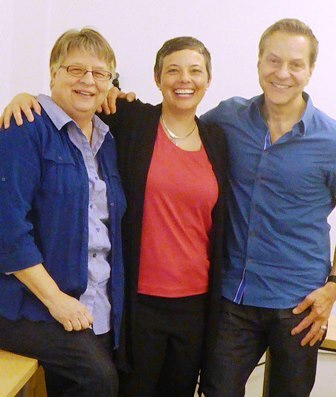 Dr. Amy Climer [center] with Dissertation Committee Chair, Dr. Mitchell Kusy [right], and Dissertation Committee Member, Dr. Carol Baron [left], at her Dissertation Defense, Santa Barbara, May 2016. 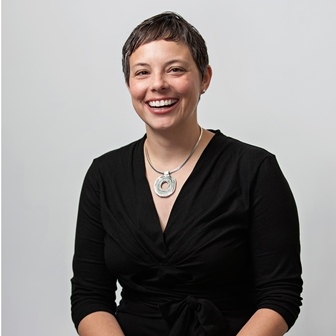 Amy Climer is the owner of Climer Consulting, a small consulting practice that helps teams be more creative. Since 1995 she has worked with hundreds of groups teaching creativity, leadership and change, team development, and facilitation skills. Amy is the designer of Climer Cards, a creativity tool used to evoke metaphors and generate ideas. She has been trained to lead the Creative Problem Solving process and is certified to facilitate the FourSight Thinking Profile and Immunity to Change. As a facilitator she engages groups to do their best work through respectful, open processes and experiential practices. Her diverse background helps her quickly build trust and engage participants in a meaningful, often fun, experience. Her work with groups has taken her to the rainforest of Costa Rica, on a ship that sailed around the world, and of course, many boardrooms and conference centers around the U.S.
Amy is the host of The Deliberate Creative, a free, weekly podcast on iTunes designed to teach others how to lead innovation in teams. She has a Master’s degree in Outdoor Education from University of New Hampshire and a PhD in Leadership and Change from Antioch University. Her dissertation research involved developing the Creative Synergy Scale for teams. More information about Amy and her consulting practice can be found at climerconsulting.com. Climer, Amy E., "The Development of the Creative Synergy Scale" (2016). Dissertations & Theses. 270.